Is Your Patchy Lawn in Need of Repair? How can you remedy a patchy lawn? We have tips and ideas about replacing patchy areas to improve the look of your lawn. 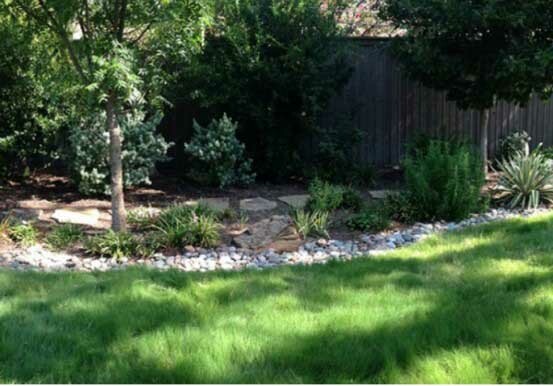 Patchy lawns seem to be a trend here in the Dallas area right now. Over the last few years, we’ve seen a rise in patchy lawns, due to a variety of weather extremes. Hard freezes, heavy flooding and heat stress have combined to create big problems for our urban lawns. Pair these weather conditions with less than ideal growing conditions (to much shade), over-watering, under-watering, fungal diseases, and soil compaction and you’ve got a recipe for a dead lawn. If your lawn is getting patchy, here are a few important things to know about the root of the problem and how to fix it. Rather than starting over, we’ll heal the soil and fill in the empty spaces. Why is your grass dying out in patches? There are a number of reasons: Fungal disease such as Brown Patch and Take-All Root Rot could for sure be the culprit. With these fungal diseases it’s important to catch them before they get out of control. Keep them from returning by understanding why your lawn contracted these diseases in the first place. Water the right way, reduce soil compaction, aerate the lawn at least once a year, and feed your soil (and your lawn) on a regimented schedule. Or, it could be insect damage. Grubs and chinch bugs can do a lot of damage to our lawns. Again, proper cultural practices, just like with the fungal diseases, will help your lawn to naturally fight off these insects as they prefer to chow down on weakened lawns first. Buffalograss has a soft, natural aesthetic and is very drought tolerant. It’s the weather. Heavy rains, which created water-logged and compacted soils, create big problems for lawns in our heavy clay soil. The result of too much water sitting in the soil for too long is root suffocation and nutrient deficiencies – both of which make your lawn more susceptible heat/drought stress, winter freeze damage and pests and diseases. 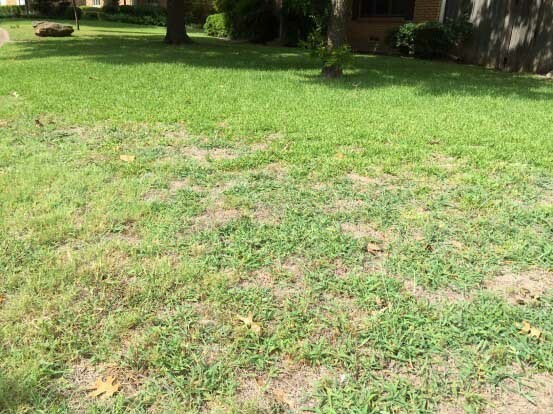 Lawns under these types of stresses tend to die out in patches. Wrong grass – wrong place! Lawngrasses are not shade lovers. If you have large shade trees, then you should expect your lawn will thin and potentially die out over time – especially in dense shade. While yes, some lawngrasses can tolerate more shade than others, even St. Augustine grass will die out in too much shade. Less than stellar maintenance? It might be time to admit that poor maintenance practices could be killing your lawn. Over- or under-watering is a lawn killer – as well as the wrong mowing height and lack of aeration and fertilization. And don’t forget your soil! Remember, it’s taken a beating from the weather over the last few years. When it comes time to try and rehabilitate your patchy lawn, you have a couple of options. Seed, or sod. Some grass species can be filled in using seed. Some can only be planted using sod. Seed is much more cost effective but it can take a lot of work to get it to germinate and fill in properly. Sod will give you more instant gratification, but you also have to make sure it roots in properly. St. Augustine and zoysiagrass are best grown from sod. Bermudagrass and buffalograss can be grown from seed or sod. Remember that if your soil is compacted and lacking organic matter and bioactivity, then filling in bare patches in your lawn will only be a temporary solution. If you are rehabilitating a patchy lawn, it’s best to aerate, add organic matter and feed the soil before you add new seed or sod in order to give your new grass the best chance for success.